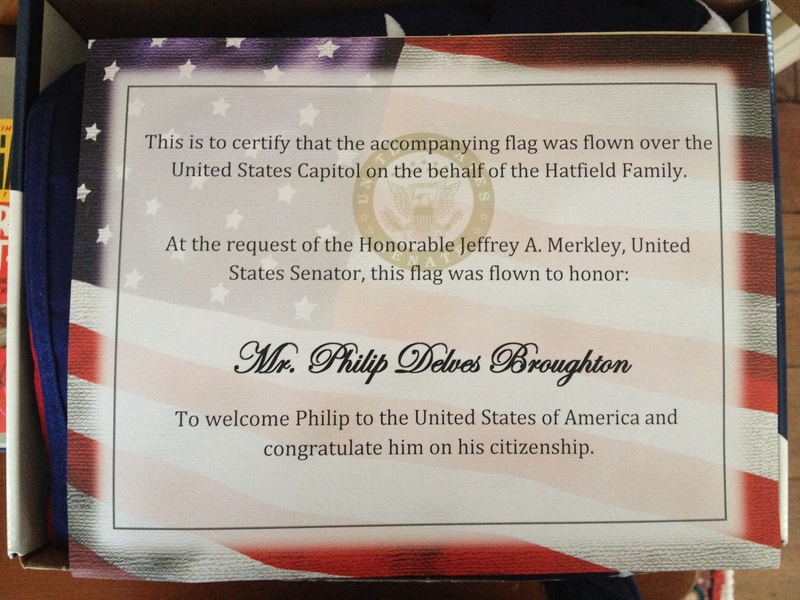 Late last year, I finally became an American citizen. It was long overdue. At one point in the process, an immigration official had to test my spoken and written English, though it was clear both were adequate. “What do we pay the United States government?” he asked me. “Taxes,” I replied. “Correct. Now please write this sentence. ‘We pay taxes'”. And with that, I passed. When I started the process, it felt merely bureaucratic. But by the end, as I raised my hand in a New Haven court house to swear the oath of citizenship, it felt like far more than paperwork. I describe it in the Wall Street Journal today, in a piece Why I Chose the Red, White and Blue. The other night, my neighbor and most excellent friend Visko Hatfield, appeared at my door with a box. In it was a flag flown over the Capitol to mark the occasion. Must now find a Marine to teach me to fold it properly.